Every once in a while, an unexpected hero rises from obscurity—the burrowling. These furry folk hail from a region known as the Wasted West. Should you find yourself in their land, be watchful. They detest violent encounters and hate goblins. However, a pleasant meeting may lead to intriguing friendships. These small and unlikely heroes rarely find themselves in harm’s way, but sometimes, one of them leaves their home to explore the world beyond their hundred holes in the ground. Their journey might begin with a tale passed down through generations of a long-ago adventurer who came through trading tales for food, spurring a wanderlust. Or they might be driven by a strong desire to protect their home from goblins. Social Life: Burrowlings are communal creatures, generally living out their short, natural lives within the confines of their small settlements. Those few traveling far from home may become extremely homesick, falling into a depression and sorrow that could lead to their death. But sometimes, they find new homes, new friends, and eventually call them family, restoring their love of life. Description: Burrowlings are small, tan-furred creatures with fluffy tails that hang just above the ground. Their black razor-sharp claws can be deadly if an opponent is caught off guard. Ability Score Increase: Your Dexterity score increases by 2, and your Wisdom score increases by 1. Age: You have a very short life span as a burrowling typically lives only up to 15 years. Languages: Common, plus one other language of your choice. Size: You are approximately 2 feet tall and weigh no more than 25 pounds. Your size is small. Speed: You are a small creature and have a walking speed of 30 feet and burrow speed of 10 feet. Burrow Awareness: Once you reach 2nd level, you have spent enough time with a group of individuals to consider them your allies. You gain advantage on Perception checks if at least one burrowling or ally is awake within 10 feet. Darkvision: You are used to dim light and darkness. You can see in dim light within 60 feet of you as if it were bright light and in darkness as if it were dim light. You cannot discern color in darkness, only shades of grey. Natural Attacks: As an action, you may make one melee attack either with your claws or your bite. Claw: Melee Weapon Attack: reach 5 feet, one target. Your attacks deal 1d6 slashing damage. Bite: Melee Weapon Attack: reach 5 feet, one target. Your attacks deal 1d6 piercing damage. Pack Tactics: Once you reach 3rd level, you have advantage on attack rolls when your target is adjacent to at least one other ally. This was one of my favorite creations for the PFRPG Midgard Bestiary. I am thrilled to see it carried forward into 5e, and I adore what you’ve done with them as a playable race! Did the writers forget the burrowing speed? 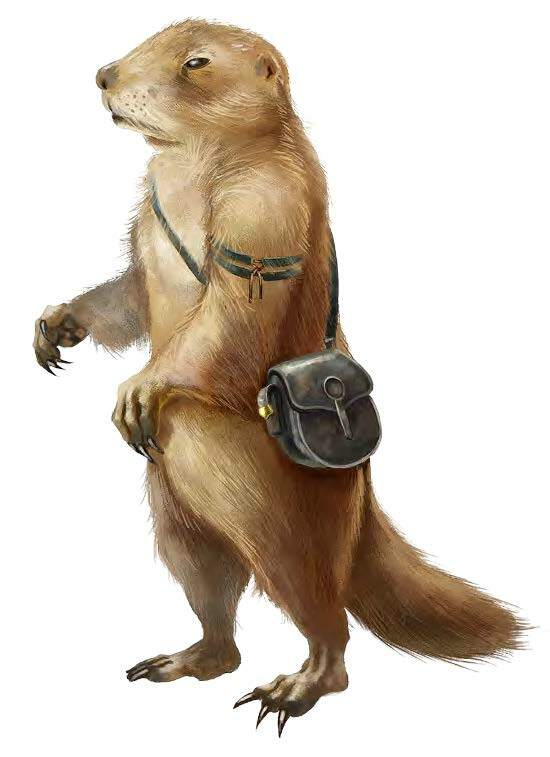 They’re also in the Tome of Beasts and they got a 10’ burrowing speed in there, but why no burrowing speed here?